His story is unique and complicated, because he is neither a professional physician nor even a Maidan volunteer. Pavlo is a web designer from Lutsk. He arrived in Kyiv on 12 December. Pavlo has a very unusual background: he is a leader of the Lutsk castle historical reenactment team and the best archer in Western Ukraine. However, right here and now he is more into saving lives than shooting. 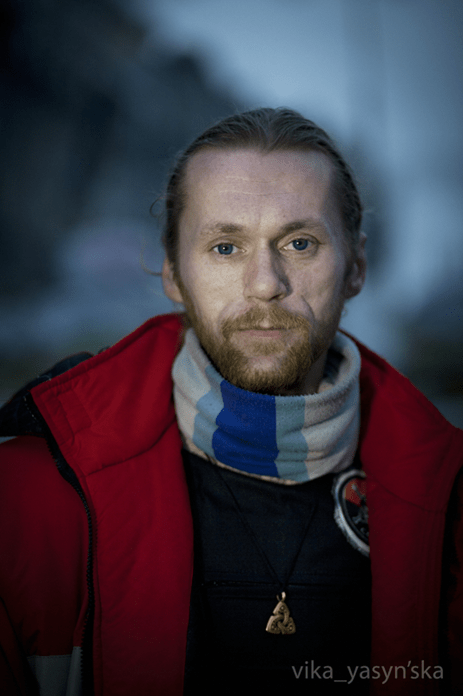 He was a lifeguard in the Russian Emergency Ministry for more than six years and so, with his good experience in field surgery treatment, he believes that Maidan is the only place for him now. He has no fear of blood and is extremely stress-proof. As Pavlo tells it, he joined the Second Self-Defense Sotnya [a special name for the self-defense division] because has already had friends there. “On 19 January,” he said, “during the peaceful demonstration, medical services were operating only within Maidan’s perimeter. So there were only two medical workers in the whole convoy when the clashes began. However, physicians began fetching up to the hot zone within half an hour. We did it at our own risk, because had been ordered to step back. The doctors did not obey the order. We thought, ‘We shall stay as long as at least one person remains here.’ First, we organized an ambulance in the archway at Hrushevskiy 4. I was giving instructions to make corridors so the wounded could be evacuated to a safer place. A crowd remains a crowd. When it became clear that things would last for a long while, we occupied the ground floor of the building, as it was impossible to bandage the wounded outside in the cold and under fire. On 22 January, during the attacks, the first aid point’s doors were closed in order to keep Berkut from entering our health center. We put a large white flag with the Red Cross on the door, and some medic T-shirts too. In fact, what was happening inside could be seen clearly through the glass doors. Nevertheless, they smashed the windows and started throwing flashbangs inside. The explosions are much louder inside, you know. But we were lucky to escape and evacuate the wounded through the back exit to October Palace. We took the wounded and the most essential medical instruments. The surgical instruments, which were almost priceless at the moment, we had to leave behind. When we came back, nothing was left. Everything was smashed and broken. I still can’t understand why and for what purpose they did it. “I will never forget that Monday night, 2 am and nobody minding the gas. Me and my colleague, another physician, were constantly watching for wounded to carry out or to run for help. So, we were just standing there waiting and smoking. Suddenly some grandma, about 70 years old maybe, comes up to us and says, ‘What are you doing, kids? You’re doctors, you should know smoking is dangerous’–and all under that smoke, gas and ashes from the burnt buses . . . that was fun. Anyhow, we had to persuade this elderly woman to leave for a safer place. “Four sotnyas [divisions] provide the perimeter guard at the barricades, while inside the scene, underground crosswalk control, the House of Trade Unions, and Kyiv City Administration are on us. People have been coming from the very beginning and more divisions have been organized; I cannot even tell you how many there are now. The second sotnya is the toughest of them all. When we kicked the internal forces away from Ukrainskiy Dim and the assignment started, they offered to let us relocate at least some of the fighters there because it was warm and dry there with the additional infrastructure provided. The answer was ‘Oh no, how could we just… go away? No, we’re going to stay here in our tent, well, we’ll light the burzhuyka [a kind of DIY stove usually meant for field use], freeze a bit but we’re not leaving.’ My place is here. Sometimes there’s a longing to go home, but maybe just for a day. When it’s quiet, I feel I’d like just to come meet my friends and kick back. Sure, stitching wounds and carrying the dead [Pavlo helped to carry Nigoyan and Zhyznevsky to the first-aid points] is no fun. Maybe I would like to go back home but though it may sound pathetic, I feel that my duty is to lend my experience for Maidan’s sake, for the rightful cause. Sometimes I think, well, maybe it would be better for me to be on guard or at the frontline, to show these titushki a thing or two. But there are enough people to do that. I am here just doing what I have to do. When the battles at Hrushevskiy Street started, for many people it was the sign of the war beginning. But the war has actually never ceased, though maybe not every story is told. Why? Because there are always titushki and provocateurs around, because there are stories of somebody caught by police when going to his friend’s for a shower. As you may know, there are very clear reasons why we prefer not to address the official hospitals and try to organize everything right here. “The fighters of the sotnyas have already become my family. We did not know each other before, but the feeling of fraternity is so intense, just as if we grew up side by side. This tent, sometimes wet and cold and crowded, is not a home yet, but it has become something very important, very communal for all of us. “The volunteer’s duties are putting in and removing stitches, bandaging wounds, and many other things,” says Victoria. She has been combining volunteering and her job so far. However, she now admits that she would rather focus on her volunteer duties as much as possible. She joined the mobile teams soon after the events at Bankova, where many of her colleagues from the Red Cross were injured. After 22 January, she started working in Hrushevskiy 1. She recalls how people were carried across the street from the old medical station by Berkut. Maidan restored her trust in her colleagues. Before that, she could not find a job in the official medical organizations. She worried about the corruption and contempt for the patients she had always observed there. Victoria says that although the medical workers here usually have very different backgrounds and political views, they are all united by what they do–and that means helping people from both sides of the barricades. She has been writing sketches about the people from Maidan on her Facebook page. These sketches are called “faces of Maidan, personal impressions.” She is sure nobody wears a disguise here, so the communication is always sincere and interesting. Nina Grygoriivna has come to Maidan from Mukachevo. She is retired now after having worked for many years as a phthisis pulmonologist and podiatrist in the regional children’s hospital. She has been volunteering for over a month and she can’t contain her emotions. 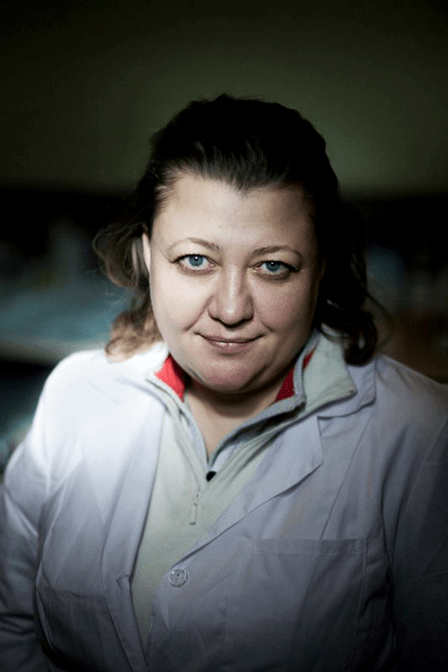 Nina Grygoriivna stresses that “nobody wants to go home and their self-sacrifice is incredible.” Agreeing with many other physicians, she says it is incredibly easy to join the Maidan team and become a part of it. Everybody, from interns to professors, are united by the common goal. This is a place for professionals, not for dreamers. It is unbelievable how steadily and coherently everyone acts. There were some paramedics who were exhausted and could not keep up the rhythm, but she can’t recall a single physician who left. Everyone who comes is aware of the reasons and the responsibility. She recalls working in the House of Trade Unions with a doctor she got a chance to know only after they had been spent eight hours working as a team. And for all those eight hours, they worked side by side like colleagues who had known each other for ages. Nina Grygoriivna says that when she took some days off and went to her home in Zakarpattya, she felt she should return, and that it was a pleasant feeling.